AMES, Iowa — Solving the parallel problems of hunger and food waste in Story County has become the avocation of hundreds of current and past Iowa State University faculty, staff and students. “I’m struck by the network of people out of the College of Agriculture and Life Sciences (CALS) who spent their careers in the field of developing and producing food and now are retired and focused on feeding people in our community,” said Steve Padgitt, emeritus professor of sociology. 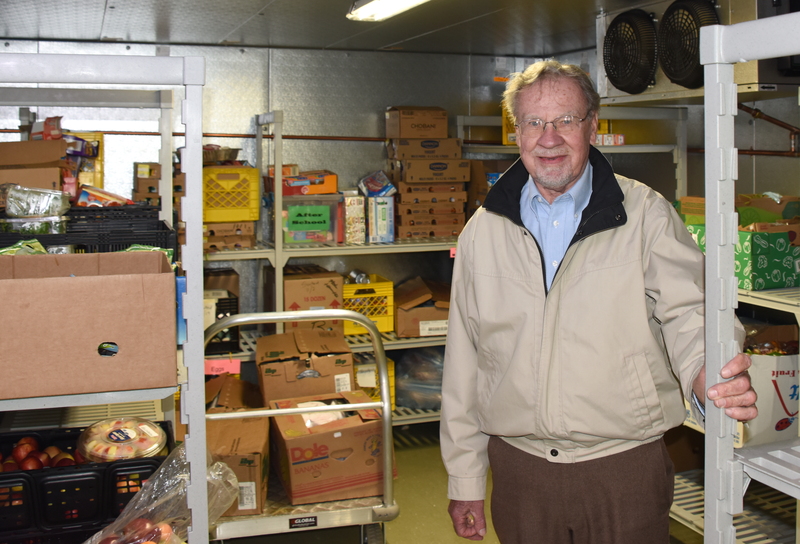 Padgitt and many of his former CALS colleagues volunteer 15 or more hours a week for Food at First (FAF), a perishable food pantry and free meal program in its 12th year. It serves an evening meal seven days a week, at First Christian Church in Ames, to an average of 75 people daily. Nearly 25,000 meals were served last year. FAF also distributes food from its perishable food pantry, at a free market, three days a week. “We're now averaging 1,400 shoppers monthly; that's over 300 weekly,” said Padgitt, who describes FAF as a "no-questions-asked, come-as-often-as-you-need-food" operation. Padgitt volunteers at FAF Monday, Thursday and Saturday markets, including transporting food to their satellite market site, at Trinity Reformed Church. As usual, on Thanksgiving the Ames community is invited to FAF’s dinner from 11 a.m. to 1 p.m. at the First Christian Church, at Sixth and Clark streets. As many as 800 are typically served and meals to the homebound are delivered. Patty Yoder, FAF’s executive director/volunteer coordinator and its only paid staff person, says its success is due to community support and a committed group of core volunteers. “Tom Fenton (emeritus professor of agronomy) – he’s here at least 35 hours a week and helps with everything. Then there’s Steve Padgitt, Ken Larson (emeritus professor of agronomy), Bernie White (emeritus professor of biochemistry), Carol Cornelius (seed analyst in agronomy), Don Wishart (retired extension editor) – they’re some of our core volunteers who work tirelessly for this organization,” Yoder said. “Others volunteers associated with Iowa State are Bob Jolly (emeritus professor of economics), John Schroeter (economics professor) and William Edwards (emeritus professor of economics), who have volunteered for a long time, as gleaners,” Yoder added. “Gleaners” pick up and transport donated food to FAF’s two distribution locations. While generous financial support comes from local churches, individuals and businesses, almost all of the food prepared for meals and distributed at FAF markets is donated from local grocers, bakeries and restaurants, as well as from local growers. From grocers, donations are often food that is nearing the end of useful retail shelf life. “For example, Sam’s Club and others that sell fresh meat give us frozen meat, when it is nearing its sell- or freeze-by date. And with produce, if it doesn’t sell by the first or second shelf day but it’s still good, a lot of stores will donate it. With our three distribution days, we can move that food quickly,” Padgitt said. Bernie White (emeritus professor of biochemistry) and many others from on- and off-campus assist with gleaning food from dining locations on Iowa State’s campus. “I coordinate the gleaning efforts of my fellow Ames Noon Kiwanians who do 11 pick-ups per week from campus cafés. I make the arrangements, promise location managers we will pick up, and fill in for volunteers on vacation,” White said. “My volunteers tell me this is a very meaningful experience for them. Even though it gets complex when the weather is bad or they have difficulty getting on campus, they would not give it up. They are totally committed to this effort,” White said. The service provided by FAF and the reliability of FAF volunteers are well-known in Ames. In addition to regularly scheduled food pick-ups, FAF volunteers receive food rescue calls. “It may be that Kum and Go has a freezer go out and their ice cream is going to melt. But, if they call us, we can be out there in an hour. The reliability of our gleaners is a big thing for us and for our food donors,” Padgitt said. Padgitt said it was the “social consciousness on the part of Iowa State students that stimulated” the first donations of foods from Iowa State dining sites. Many sororities, fraternities and other student groups help with on-campus gleaning. White says café operators are pleased to see the food being repurposed and not thrown away. In addition to gleaning, hundreds of Iowa State students volunteer for FAF by holding annual food drives; planning, preparing, serving and cleaning up after FAF’s daily meals; and growing vegetables in gardens on- and off-campus. Garbrielle Roesch-McNally, a doctoral candidate in sociology and sustainable agriculture, volunteered as soon as she joined the Sustainable Agriculture Student Association (SASA) in 2012. “I got involved with that right away because I already had some chef experience. I stepped in and worked with another student as co-head-chef for the meals we prepare,” Roesch-McNally said. In addition to the monthly meal, SASA students raise an abundance of herbs, fruits and vegetables in a plot behind Trinity Christian Reformed Church. Rebecca Roberts, graduate student in agronomy and sustainable agriculture, learned about FAF as a SASA member in 2013. In 2014 she managed Iowa State’s Student Organic Farm, which donates produce to the program every summer. She says her volunteer work at FAF complements her studies. “Food distribution and affordability are two main problems that keep people from having access to food. I like that this program makes food accessible for all regardless of income. People may not have time to cook nutritious food and this program helps with that problem, too,” said Roberts. Roberts and Roesch-McNally say they like that FAF does not require people to prove their need for food and that people in the situation of needing food assistance may feel stigmatized, especially if asked to prove their need. According to Feedingamerican.org, one in seven people in the U.S. struggles with hunger. Volunteer or donate to Food at First by going to its website at: https://foodatfirst.wordpress.com/. Tom Fenton, emeritus professor of agronomy, makes a delivery at Food at First. 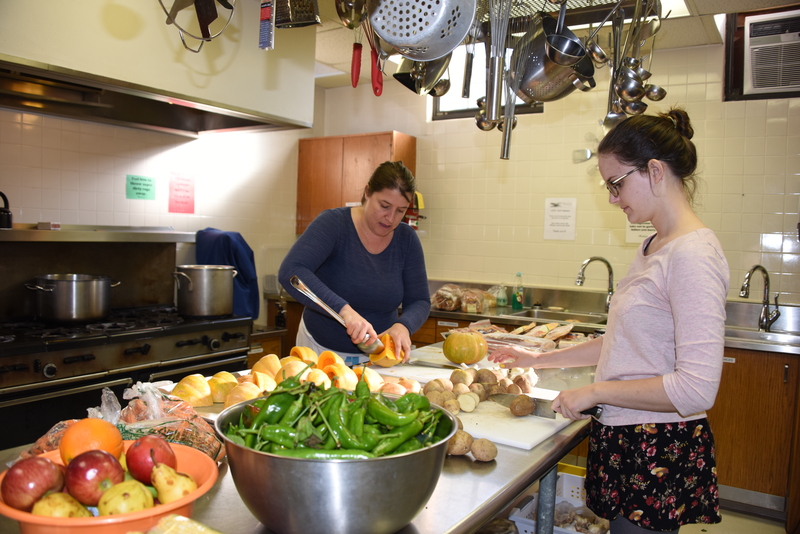 Iowa State graduate students Gabrielle Roesch-McNally (left) and Rebecca Roberts prepare a meal at Food at First.